AKIPRESS.COM - Turkmenistan took part in the cultural event named Delicanto – Here Eats the World that took place at the Royal Porcelain Factory in the German capital. 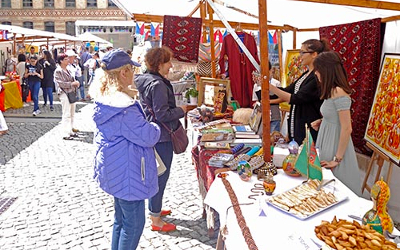 The event aimed at finding new ways of the dialogue between cultures, exchanging humanitarian information and learning about the tourist attractions and culinary traditions of different countries, reports Turkmenistan.ru. The Embassy of Turkmenistan set up a special thematic exhibition marking the Year of Honoring the Heritage and Transformation of the Fatherland that is currently under way in the country. Visitors had the opportunity to view famous Turkmen carpets, colorful paintings, national dress and handicrafts. The exhibition also displayed books, magazines and booklets describing the rich culture, history, nature and modern development of Turkmenistan. Visitors also had the opportunity to taste the unique dishes of Turkmen national cuisine. According to organizers, over 10 thousand people visited the three-day event.